A team of speech-language pathologists focuses especially on mitigating the speech and language problems experienced by infants and toddlers (ages birth to three) with cleft palate. Parents can use the book’s dozens of practical, hands-on activities to improve their child’s speech. For example, Bug Race! uses a cotton ball or pom-pom—add eyes and voilà, you have a bug!—that the child moves by releasing pressure from behind the lips to stimulate oral airflow to produce the consonant /p/. Build valuable speech skills while you both have fun! 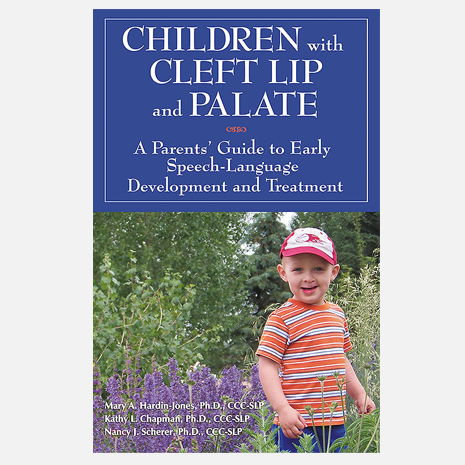 Helpful strategies, illustrations of cleft repair procedures, photos of equipment, and recommended resources empower parents to get started on addressing speech problems of very young children and other issues for school-aged children. Speech-language pathologists, early intervention specialists, and medical professionals will also want this book to recommend to the families they serve. Mary Hardin-Jones is a Professor in the Division of Communication Disorders at the University of Wyoming. She has served on cleft palate teams in several different states throughout her career and has been actively involved in research studying speech production of children with cleft lip and palate for over thirty years. Kathy Chapman is a Professor in the Department of Communication Sciences and Disorders at the University of Utah. Her research has focused on describing the speech and language development of infants and preschoolers with cleft palate. Nancy J. Scherer is Professor and Chair of the Speech and Hearing Science department at Arizona State University. Her research and clinical interests have addressed the assessment of speech and language development of children with cleft lip and palate and other craniofacial conditions, and models of early intervention for children with cleft lip and/or palate.